Do you have a great deal of indigestion or a burning sensation in the center of your chest? Do you regularly get sour or bitter-tasting fluids in your throat or mouth? Do you need help sitting up when you’re lying down, or avoid bending over to prevent acid from backing up into your throat? If you can answer “yes” to any of these questions, you might have chronic heartburn or GERD (gastroesophageal reflux disease). Now, there is a non-invasive test for heartburn – it’s called Bravo. The results from this quick and easy diagnostic test will tell your doctor what is causing your symptoms and what is the best treatment to prescribe for you. Heartburn occurs when contents from the stomach flow back up into the esophagus. Heartburn usually begins as a burning feeling in the center of your chest. Often, there is a sensation of food or fluid coming back into your throat and mouth that typically tastes sour or bitter. The burning sensation can last for hours and is often worse after eating. Many people occasionally experience heartburn. But, heartburn can be a symptom of a more serious condition, GERD. Frequent or chronic heartburn (more than twice per week) may be associated with a more serious problem known as GERD. The heartburn may be so severe that it interferes with your daily routine. Damage caused by GERD can lead to more serious medical problems such as difficulty in swallowing (dysphagia), narrowing of the esophagus (strictures) or Barrett’s Esophagus. How are Heartburn & GERD Diagnosed? The traditional way to measure pH levels in the esophagus is to place a catheter, which is connected to a monitoring device on the patient’s belt, down the nose and into the esophagus. Many patients complain of nasal discomfort and are embarrassed to go out with the catheter in their nose. Now there is a more patient-friendly pH test for diagnosing heartburn and GERD – it’s called Bravo™. This test allows your doctor to evaluate your heartburn symptoms to determine the frequency and amount of acid refluxing into your esophagus. Bravo is the world’s first catheter-free pH monitoring system that allows patients to maintain their regular diet and activities without the embarrassment and discomfort associated with traditional pH catheter systems. The test involves a miniature pH capsule, approximately the size of a gelcap that is attached to your esophagus. Throughout the test period, the Bravo capsule measures the pH in the esophagus and transmits this information to a pager-sized receiver worn on your belt or waistband just like a pager or mobile phone. You will be given a diary to write down the times when you have reflux symptoms (for example, coughing, heartburn, regurgitation), when eating or when lying down. After the test is completed, you return the diary and the Bravo Receiver to your doctor and the information is uploaded to a computer, which provides a comprehensive report so the physician can diagnosis your condition. What are the benefits of the Bravo System? The Bravo pH system provides comfort and convenience. Data is recorded when the capsule and receiver are within 2 - 3 feet of each other. What this means is you can bathe and get a restful night’s sleep because you can place the receiver outside the shower or on your nightstand and the test will not be interrupted. How long does the Bravo test take? The capsule takes only moments to place in the esophagus during an upper endoscopy. Then, the Bravo test lasts either 24 or 48-hours, depending on what your physician requests. Will the Bravo test restrict my diet and activities? When scheduling you procedure, you will be given instructions on restrictions prior to and following procedure. Your physician may ask you to stop specific medications for GERD, please contact your physician to confirm if you need to continue or discontinue GERD medication for exam. What happens when the Bravo test is complete? After the test period, you return the Bravo Receiver to your physician’s office. The test data is uploaded to a computer and analyzed by your doctor. Your physician will inform you of your results soon after the test. Several days after the test, the capsule naturally falls off the wall of the esophagus and passes through your digestive tract and is eliminated from the body. Will I feel the capsule during the test? Some patients say they have a vague sensation that “something” is in their esophagus. Some patients say they feel the capsule when they eat or when food passes the capsule. Should you experience this, chewing food carefully and drinking liquids may minimize this sensation. Unfortunately, it is not for everyone. 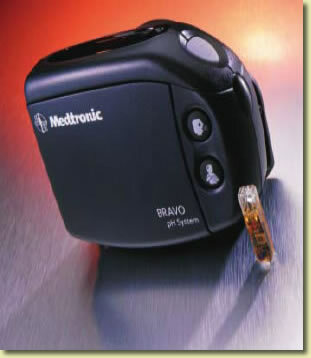 Patients with pacemakers, implantable defibrillators or neurostimulators cannot use Bravo. Patients with a history of bleeding diatheses, strictures, severe esophagitis, varices and obstructions are not candidates for Bravo. Please ask your doctor or nurse any other questions you have about Bravo.